Rainbow Stew and the Lack of Children’s Books Published by and about People of Color | What is ML Reading? A friend made me aware of the latest findings by the Cooperative Children’s Book Center in their annual study of Children’s Books by and about People of Color Published in the United States. She posted a link to the New York Times article The Apartheid of Children’s Literature by Christopher Myers, which discussed the senseless reasons of this deficit. This week I read Rainbow Stew during my story times about rain. A Grandpa’s grandchildren are visiting. He wakes them in the morning with the smell of pancakes. Then, leads them on a adventure during a rainy day. They explore his garden, pick vegetables for rainbow stew, make the stew, read while waiting for it to finish, and finally enjoy a family meal. It’s the story of a Grandpa’s love. I perform five story times a week. Each time I read Rainbow Stew when I reached the page where the children track in mud and water, I asked, “Do you think Grandpa minded?” It was always a resounding, “No!” Every child could relate and enjoyed the book. I am sure it was one of the 93 books of the 3200 books received by the Cooperative Children’s Book Center last year by or about African-Americans. The preschoolers were entranced by this book. As was ML, a Caucasian first-grader with a touch of freckles. I agree with Chris Myers, it’s time for publishers to step up to the plate. Stop talking about this ambiguous market, give consumers an opportunity. I’m pretty certain they will prove “The Market” wrong. The love of a Grandpa is the same no matter one’s skin shade. As are a many other experiences highlighted mainly in books with characters of Caucasian descent. 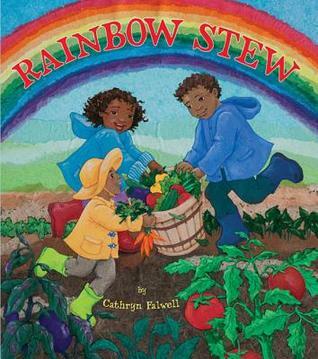 This entry was posted in Picture Book and tagged Cathryn Falwell, Rainbow Stew by mlreads. Bookmark the permalink. Pingback: Walter Dean Myers – Rest In Peace | What is ML Reading?